Fusion supplies a truly comprehensive Time and Attendance package with an intuitive, secure and instantly accessible database resulting in accountability and consistency whilst providing informed planning for managers and staff. 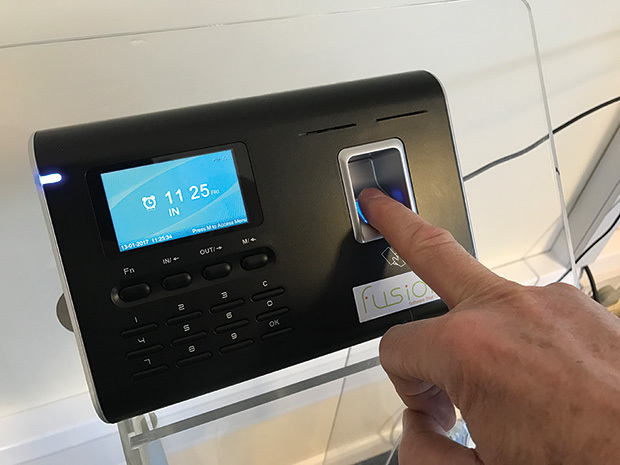 Our biometric Time and Attendance device populates timesheets, verifies hours worked to shift and exports to your payroll software, thereby improving punctuality and efficiency at the same time connecting people to the information they need as they need it, reducing errors and improving compliance. You can use a combination of clocking options to suit the way your care business works. Using a physical characteristic rather than simply using a swipe card or PIN, ensures the employee is actually present. This avoids issues such as “buddy punching”, a term used to describe when other employees clock in and out for one another. The software also provides valuable absence, rota and training information to provide managers with real-time staffing information and reporting with ease. Real time dashboards and reports can be viewed 24/7 by HR, operations and finance teams. See immediately who’s clocked in or out, hours worked, sick or on holiday. Fusion integrates management systems and business processes to increase profitability. Developed by our team of software innovators Fusion software is a reliable and flexible business tool. The system integrates into your daily working life to replace and streamline many of your laborious and time consuming tasks. We use state-of-the-art web based technology with an easy to operate modular software system to enable you to manage the increasing demands to provide huge amounts of management data with total security via SSC and IP checking. Fusion Care Solutions are a market leader in the provision of cloud/web based software including time & attendance, service user/resident billing and care plans enabling providers to meet their goals and obligations by managing systems, processes and care with transparency, best practice and high standards.